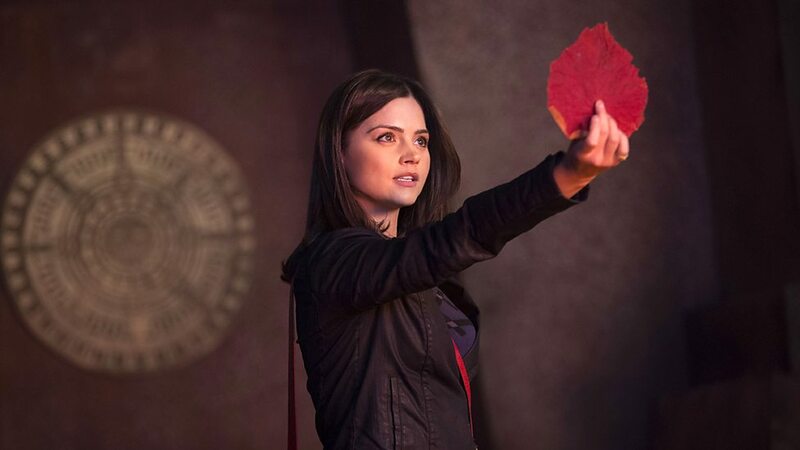 Clara, inconstancy and The Rings of Akhaten (2013) | Randomwhoness: a Doctor Who blog by Johnny Spandrell. Sampling stories in random order. That’s OK, Doctor Who is about change, perhaps more than any other TV show. But the ever changing titles add to a feeling in the show in recent years which if I’m feeling kind I’d call variety, and if I’m less kind, I’d call inconstancy. I’m not sure if I’m feeling kind or not. But whether it’s variety or inconstancy, it’s reflected in the Doctor’s latest travelling companion. The Rings of Akhaten is the fourth story to feature Clara (Jenna-Louise Coleman) but we’re only just getting to know her. That’s because she’s had three introductory stories in three different guises. As we’ll eventually find out, this is because she’s the “impossible girl”, making multiple appearances across the Doctor’s time line. But even without this narrative trickery, Clara is a slippery character to grasp. In The Bells of Saint John she’s cool and sassy. Here she’s much more vulnerable and cautious. Just which Clara is the real one? The sensible charmer of Cold War? The bold strategist of Nightmare in Silver? The thrill seeker of Hide? She’s a million different people, as The Verve might say, from one day to the next. Is this sloppy characterisation, or a deliberately planned approach, one that seeks to make the impossible girl unknowable too? If there’s a template for Clara, it’s classic companion Sarah Jane Smith. Like Sarah, Clara doesn’t travel with the Doctor full time. She has a life which is peppered by trips in the TARDIS. Some say this is a better set up for a female companion; by having her own life she’s not forever trailing around the Doctor, wherever he chooses to take her. But Sarah was more or less the same after each sojourn into real life. By contrast, big changes happen in Clara’s life away from the TARDIS. In Series 7b, she’s a nanny to the Maitland family, a cause she feel so strongly about that she decides she cannot travel full time with the Doctor. But between The Name of the Doctor and The Day of the Doctor, she’s become a teacher, so at some stage she’s cut the cord with the Maitlands. By The Time of the Doctor she’s moved house and we meet her contemporary family (and her Dad’s played by a different actor, a subconscious emphasising of her ever changing life). In Series 8, things change again. Series 7 Clara seemed always to be presenting a facade to the world; she was a mystery to solve and our perspective on her was always the Doctor’s. When he regenerates, Clara becomes our identification figure; we sympathise with her situation, trying to make sense of a best friend who has radically changed. It’s a complete u-turn and one which does the character no end of good. It’s telling that in her interview in DWM482, Jenna Coleman describes this change as the mystery of the impossible girl being “out of the way”. And it does feel like that, like an obstruction removed. In Series 8, Clara’s personality seems to stabilise and for the first time we truly get to know her. No longer is she a different person from one episode to the next. She’s consistently a kind, funny, slightly controlling young professional who takes her job very seriously and is not above lying to her nearest and dearest. She’s fun to be around, and you couldn’t always say that about her Series 7 version. But her new boyfriend Danny Pink (Samuel Anderson) has noticed that she’s always mysteriously changing her story or unexpectedly changing her clothes. There’s still an air of mutability about her. Then just as we start to know her, she leaves. In the same way as she arrived, which is over and over again. Kill the Moon and Death in Heaven both feature leaving scenes for her, and Last Christmas hints strongly that her time with the Doctor is ending, only to do a last minute reversal. This is a character who is always going to keep us guessing. The actor playing her has even changed her name. Ah, inconstancy, thy name is Clara. But back to The Rings of Akhaten. It’s an odd mix of elements, with a song thrown in for good measure. It has an ever changing roll call of monsters, keeping us guessing as to who is the real threat. Is it the creepy, whispering Vigil? No, they exist only to take young Merry Galel (Emilia Jones) to Grandfather, a mummy in a glass box. Is it Grandfather then? No, he’s there only to wake up the Old God. And the Old God? Well he’s a big smiley-faced planet, sucking out people’s stories. Of the three threats, he’s the most oblique. But it gives the Doctor (gangly Matt Smith) the opportunity for a showy monologue about life, to be rolled out as a party piece at many a convention. He and Clara come to this latest destination because she asked to be taken ‘somewhere awesome’. But shortly after arriving on this latest version of the Star Wars Cantina scene, the Doctor buggers off for a while. Obviously the Rings of Akhaten aren’t awesome enough to hold his attention for long. Clara marks time by helping to hide Merry from her pursuers, but still the Doctor’s gone for a good five minutes of screen time. Where did he go? Was he off on a miniadventure, destined for a never seen minisode? Did he wander off for a quick brewski? Or did a cute alien catch his eye and did he sneak away for some ‘dancing’? Make up your own story, I say. The Rings of Akhaten isn’t going to tell you. In reality what happened was that scheduling difficulties meant writer Neil Cross had to supply the production with some Matt Smith-free minutes. Back in the sixties, the Doctor would have just hit his head and had an episode off. But as we know, things change. ADVENTURES IN SUBTITLING: “It’s awake?” Clara says about Grandfather. “What’s it doing?” The Doctor’s subtitles say “Having a nice rest”. But he’s having a nice stretch. Because he’s woken up. That’s the whole point. But it must be said that the song which permeates this episode is more comprehensible (and thus much easier to take) with the subtitles on. LINK TO A Town Called Mercy. Both are about attempts to protect someone (Jex, Merry) from being harmed by monsters. And of course both are from the same production block. Bit tenuous, I suppose. Pity we couldn’t have had another Western, eh? NEXT TIME: The Gunfighters. Of course it is. Let’s hope the piano knows it.